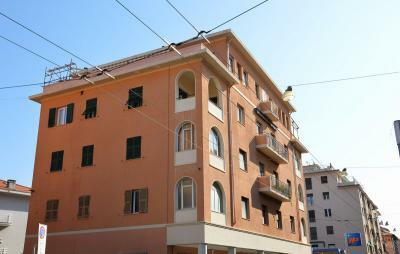 Bordighera 2 bedroom Apartment for Sale with large terrace and nice view. At only 10 minutes walk to the beaches of Bordighera, in one of the most exclusive and quiet areas, 2 bedroom Apartment for Sale situated in a pretty small building surrounded by greenery. This Apartment for Sale in Bordighera enjoys an independent entrance and consists of: a large terrace, living room, kitchen, master bedroom, second bedroom and 1 bathroom. An open parking space and a cellar are also included.